Entertaining. Sparks some thoughts to the challenges that will be faced in the future with space travel. Faux drama, annoying, voyeuristic presenter, fake news style editing and production, and not enough science. Negative five stars. On a remote mountain in Hawaii, there's a fake planet Mars. Six volunteers are secluded in an imitation Mars habitat where they will work as imitation astronauts for one very real year. The goal: to help NASA understand what life might be like on the red planet—and plan for the day when the dress rehearsals are over, and we blast off for real. Host Lynn Levy has been chronicling this experiment from the moment the crew set foot in their habitat, communicating with them through audio diaries that detail their discoveries, their frustrations, and their evolving and devolving relationships with each other. From those diaries, Gimlet Media has crafted an addictive serialized documentary: the true story of a fake planet. Introducing The Cut on Tuesdays, a new podcast from <em>New York Magazine</em>’s <a href="https://www.thecut.com/">The Cut</a> and Gimlet Media. It’s a show about being a woman in the world, about how weird and messy and laugh-until-milk-comes-out-your-nose funny that can be.&nbsp;<br><br>In this episode, host Molly Fischer investigates: what’s going on with pubic hair these days?&nbsp;<br><br>You can find more from The Cut on Tuesdays every week, wherever you get your podcasts. What's it going to take to actually get us to Mars? Plus, what to do once you’ve listened to every episode of <em>The Habitat</em>.<br><br><em>The Habitat</em> is a production of Gimlet Media. It’s produced by Lynn Levy, Peter Bresnan, and Megan Tan. Our editors are Alex Blumberg, Jorge Just, Caitlin Kenney, and Blythe Terrell. Music and sound design by Haley Shaw. Mixing by Catherine Anderson. Music supervision by Matthew Boll. Our credits music in this episode is performed by Sammy Miller and the Congregation, and written by David Bowie.<br><br>Find the NASA audio archive here: <a href="https://archive.org/details/nasaaudiocollection">https://archive.org/details/nasaaudiocollection</a>.<br><br>To find a list of our sponsors and show-related promo codes, go to <a href="http://gimlet.media/OurAdvertisers">gimlet.media/OurAdvertisers</a>. The crew feels all warm and fuzzy. <br><br><em>The Habitat</em> is a production of Gimlet Media. It’s produced by Lynn Levy, Peter Bresnan, and Megan Tan. Our editors are Alex Blumberg, Jorge Just, Caitlin Kenney, and Blythe Terrell. Additional reporting in this episode by Eric Eddings. Music, sound design, and mixing by Haley Shaw. Music supervision by Matthew Boll. Doo-wop vocals by Nico Osborne and Sean Zuni Green. Our credits music in this episode is performed by Cyprien Verseux, and written by David Bowie. Our fact checker is Michelle Harris. Thanks to Eric Mennel for all his help. And a very special thanks to the HI-SEAS crew: Andrzej, Christiane, Cyprien, Carmel, Shey, and Tristan. <br><br>To find a list of our sponsors and show-related promo codes, go to <a href="http://gimlet.media/OurAdvertisers">gimlet.media/OurAdvertisers</a>. Episode 3: Why Are We Like This? The crew gets bad news. 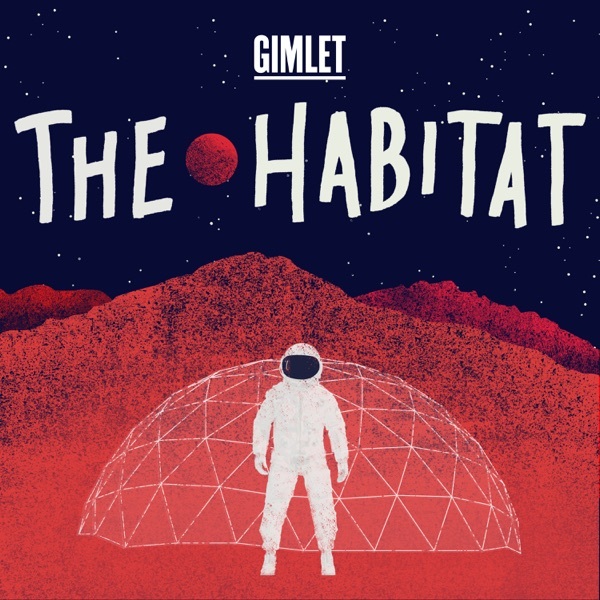 <br><br><em>The Habitat</em> is a production of Gimlet Media. It’s produced by Lynn Levy, Peter Bresnan, and Megan Tan. Our editors are Alex Blumberg, Jorge Just, Caitlin Kenney, and Blythe Terrell. Music, sound design, and mixing by Haley Shaw. Music supervision by Matthew Boll. Our credits music in this episode is performed by Reps, and written by David Bowie. Our fact checker is Michelle Harris. Special thanks to Jasmine Romero for sorting through hours and hours of boring astronaut tape to find the very MOST boring astronaut tape. And a very special thanks to the HI-SEAS crew: Andrzej, Christiane, Cyprien, Carmel, Shey, and Tristan. <br><br>To find a list of our sponsors and show-related promo codes, go to <a href="http://gimlet.media/OurAdvertisers">gimlet.media/OurAdvertisers</a>. The crew explores their new home. <br><br><em>The Habitat </em>is a production of Gimlet Media. It’s produced by Lynn Levy, Peter Bresnan, and Megan Tan. Our editors are Alex Blumberg, Jorge Just, Caitlin Kenney, and Blythe Terrell. Music, sound design, and mixing by Haley Shaw. Music supervision by Matthew Boll. Additional music by Charlie Palmieri. Our credits music in this episode is performed by Serengeti, and written by David Bowie. Our fact checker is Michelle Harris. Special thanks to Peter Bresnan for his extensive research on the history of space pooping. And a very special thanks to the HI-SEAS crew: Andrzej, Christiane, Cyprien, Carmel, Shey, and Tristan. <br><br>To find a list of our sponsors and show-related promo codes, go to <a href="http://gimlet.media/OurAdvertisers">gimlet.media/OurAdvertisers</a>.